Winter can be a devastating time of year for individuals who must be outdoors for prolonged periods. In locations where the temperatures drop below freezing, you have to have the right type of apparel and gear to prevent serious issues such as hypothermia or frostbite. Failure to bundle up when you go outside during severe winter weather could be hazardous to your health. Along with keeping you safe from injury, the clothing and gear that you layer up with in the winter should also keep your comfortable, dry, and warm. There are plenty of accessories available that can help those who love the great outdoors enjoy their favorite pastimes even in chilly conditions. One of the best to hit the market in recent years are 35 Below Socks. 35 Below Socks – What Are They and Do They Work? What Makes 35 Below Socks So Unique? How Does the Public Perceive 35 Below Socks? 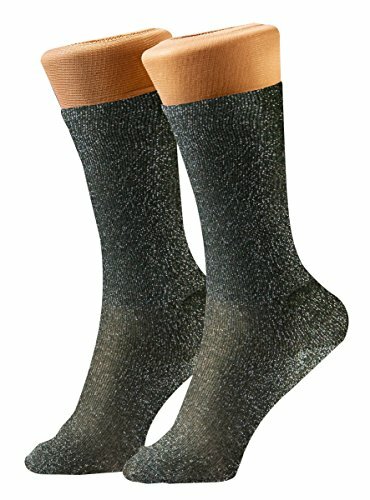 How Do 35 Below Socks Compare to Similar Products? Designed to keep you safe and warm during the most frigid weather conditions, 35 Below Socks are super soft and comfortable to wear. These socks are made with nylon knit fabric and feature aluminized threads which are woven into them. These threads are what set 35 Below Socks apart from all other types of winter apparel. The socks are lightweight and thin, making them comfortable to wear alone or as liners underneath your regular socks, which can provide you with a snug fit. These socks are the perfect choice for hunters, skiers, hockey players and anyone who loves to spend time outdoors during the winter season. They are also great to wear any time you want to add a little extra warmth to your fall or winter wardrobe. 35 Below Socks are also great for park rangers, road crews, emergency responders, electricians, plumbers, and anyone who may have to work outdoors even when the temperature drops below zero. These socks are easy to clean and care for. They are machine washable and safe to place in the dryer, so there’s no special cleaning instructions involved. They are ideal for both men and women and are available in various sizes. You may purchase 35 Below Socks in either Black or White. 35 Below Socks claim that they are perfect for anyone to use, including Men, Women and Children. They are versatile enough to wear both indoors and outdoors, even if the weather isn’t chilly outside. These socks are marketed to be worn daily while you do outdoor tasks such as shoveling snow or stacking firewood. They are also great to wear anytime you want an extra layer of warmth whether you are running errands, dropping the kids off at school, heading to work or going for a hike. Each order of 35 Degree Socks includes 3 pair of machine washable, winter weather socks. They are available in either black or white, but the white socks are more of a gray-ish tone. The socks are very soft to the touch and comfortable to wear. They are thin enough to wear underneath your regular socks, or you can always wear them on their own. The thin fabric is very breathable and makes it easy for you to move. The secret behind 35 Below Sock technology is in the special aluminum threading that is woven in the fabric. Known as Aerospace Fabric Technology, the thread becomes infused with the nylon knit fabric to make the socks soft and comfortable to wear, but the benefits don’t stop there. The special thread reflects the body heat of the wearer so that they will stay warm no matter what the temperature may be outdoors. The unique weave also works to wick away moisture to keep your feet dry and prevent serious issues when you are exposed to the cold. Because the socks are thin and lightweight, you can wear them during any type of physical activity. This makes 35 Below Socks perfect for athletes and outdoor enthusiasts who enjoy taking part in winter sports. 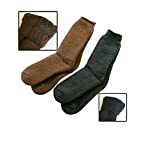 However, they are equally as beneficial to anyone who wants to keep their feet warm, safe and comfortable this winter. The price for 35 Below Socks can range between $ and $ for a pack of 3 pairs depending on the size you choose, and where you buy them. You may be able to find them at a cheaper price by searching online or visiting several retailers in your area that sell As Seen on TV items. The price may seem expensive for three pair of socks, but when you compare 35 Below Socks with other thermal, winter, or moisture wicking socks, you will find that they fall into the same price range or may even cost you less. Many people are skeptical when it comes to understanding how 35 Below Socks work and if they are worth buying. If you have never worn a pair of thermal or wicking socks in the past, then you may think that these socks are a hoax and that no such technology exists. However, there are socks and other winter clothing items available that will help keep your feet dry and warm while you are exposed to frigid temperatures. As with any As Seen on TV item, most consumers know that they are taking a risk when they purchase a product like 35 Below Socks. Many times, we don’t get the exact results we had hoped for with these products since the marketing team tends to elaborate the features and benefits of the product. That is why it is best to read up on real customer reviews and decide for yourself if this product is worth your time and money. When you purchase a pair a winter socks, you usually buy a pair that is very thick and made of warm materials. While they may keep your feet warm, the thickness of the material can often cause your feet to get too warm, and they start to sweat. If this occurs while you are still exposed to cold temperatures, you could risk getting frostbit, or endure severe pain once you return back inside where it is warm. Insulated boots and thick winter socks may help to keep your feet warm initially, but they are only good to use for a short time. These products aren’t always as effective as you would think. However, if you use a pair of 35 Below Socks as a liner underneath your regular socks, you can be assured that your feet will remain warm and dry. These socks are infused with breathable nylon fabric that minimizes sweating to guarantee that your feet will remain dry. And the thinner material means that you don’t have to deal with thick and bulky socks that may inhibit your movement. After using the products, ourselves and checking out reviews from other consumers, we feel that 35 Below Socks are a great item for anyone who lives in cold climates or those who simply hate to have cold feet. They can be used by both men and women and are available in various sizes. These socks are perfect for wearing while you do daily chores, run errands or spend time outdoors. They are the ideal accessory for hunters, skiers, runners, hikers, mountain climbers and people who work outdoors during winter. When compared to other socks that claim to keep your feet warm and dry at all times, we feel like these socks are a great value. They are durable enough to be worn all throughout the winter season and may be worn with any type of shoe from work boots to sports shoes. Many as Seen on TV products do not receive good reviews because they fail to provide the quality results they claimed in their ads. It can be difficult for any product to live up to the hype portrayed in some of the infomercials that we see on TV today. Therefore, consumers should make this type of purchase with an open mind and understand that sometimes a product may still work, but it just doesn’t work exactly as advertised. 35 Below Socks have received several negative reviews from users who claim that they don’t work at all. However, there are other reviews where users state that the socks work great, just not exactly as described. While they may not keep your feet toasty warm once temperatures actually reach 35 degrees below zero, they will help add an extra layer of warmth and protection to your feet when during the cold winter season. Another disadvantage that is brought up often in reviews for 35 Below Socks is that they run a little small in size. That could be because they are meant to fit tightly, similar to pantyhose. The material will stretch, however if you have concerns you may want to go up a size just in case. It’s important to be sure that these socks will work efficiently enough for you before you choose to wear them out in frigid temperatures. Don’t assume that they will keep your feet at the optimal temperature the first time you wear them when it is freezing outdoors. It’s a good idea to test the socks out beforehand when it is cold, but not dangerously cold outside. Then you will have a better understanding of how the socks work and if they will provide you with the heat you need to keep your feet comfortable and dry. There are several alternatives to 35 Below Socks now available in stores and online. These alternative socks offer you many of the same benefits while also helping you save money, since some are more affordable than others. 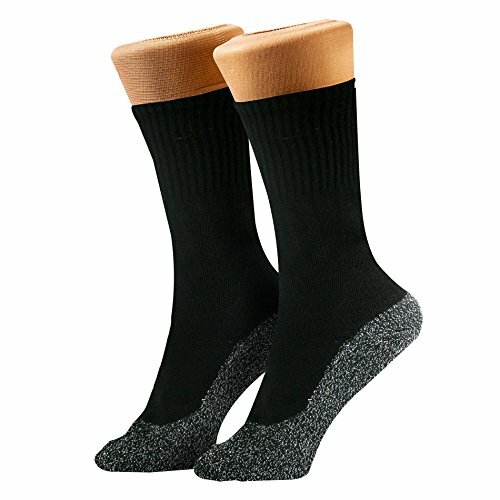 35 Below Arctic Socks are an alternative sold by Hampton Direct. They are comfortable to wear and feature the same unique weave design for added warmth. These socks are made from a blend of nylon, merino wool, and acrylic materials for additional comfort. These socks feature a standard crew style sock cut and the contoured heel helps prevent any uncomfortable bunching or slipping. The main difference between these and 35 Below Socks is that these are too thick to wear underneath your regular socks. HK Series has a selection of thermal crew socks that provide you with anti-bacterial and anti-odor features. A pack of 3 costs as low as $16, depending on the style you choose. These socks are designed to be used by skiers, runners, winter athletics, hiking, camping, and more. They provide the wearer with a minimal amount of friction and plenty of support for their foot arch. This makes the socks very comfortable to wear while being active. The special blend of fabrics helps with the anti-bacterial properties of these socks, which helps to cut down on odors and prevent foot infections. The fabric is designed to keep your feet dry and in turn, help them stay warm in wet or wintery conditions. 35 Below Socks are a great option for individuals who love to spend time outdoors all throughout the year. They can help keep your feet warm as you avoid frostbite and keep moisture away so that you stay dry. These socks are a great value because they may be worn with any type of footwear. Therefore, you don’t have to purchase thermal socks for your boots, winter socks for your athletic shoes, and another pair of thick socks for your dress shoes. Instead, you can wear your 35 Below Socks with any type of shoe that you own and remain comfortable at the same time. 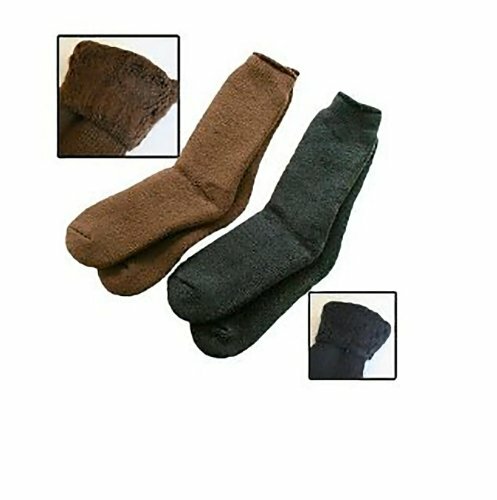 These socks are made from strong and durable materials so that you can wear them one winter season after another. They are available to purchase in various sizes for both men and women. You can find them on the manufacturer’s official website or buy them from any retailer who sells As Seen on TV products. Designed to keep you safe and warm during the most frigid weather conditions, 35 Below Socks are super soft and comfortable to wear. These socks are made with nylon knit fabric and feature aluminized threads which are woven into them. These socks are the perfect choice for hunters, skiers, hockey players and anyone who loves to spend time outdoors during the winter season. They are also great to wear any time you want to add a little extra warmth to your fall or winter wardrobe.